We Are Fly Fishing in the Wind River Range. 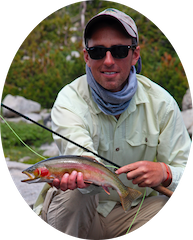 Sweetwater Fishing Expeditions, LLC is a fly fishing outfitter in the Lander, Wyoming area specializing in guided camping trips into the grand and rugged Wind River Mountains and day fly fishing excursions on the smaller streams coming out of the east side of the Winds. We live a simple, rustic life in these mountains, camping right where the fishing is best. Our purpose is to fish where it is truly beautiful, where we don’t feel confined, where there are no crowds. Since 1977, we have been the fly fishing "experts" in the "Winds." We do animal supported walking trips, full horse pack trips, and backpacking trips. We specialize in fly fishing solitude and golden trout. 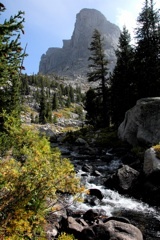 The Wind Rivers are a rugged, rocky mountain range, with active glaciers and steep granite walls. The world's largest herd of Bighorn Sheep reside here, not to mention moose, elk, deer, and smaller mammals. The range, varying in elevation from 8,000 to 13,800 feet, is known for thousands of glacially carved lakes, often inhabited by trout. Brook and cutthroat trout predominate, but golden, rainbow, brown, and lake trout can often be found. We take only small groups on our fly fishing trips and can objectively say we have something for everyone. Our trips are custom- designed to the guests’ wishes. We can choose areas where you catch a trout on every cast or only see five-pound cruisers. With so many lakes (and the streams running between), we have lots to choose from. The golden trout can usually be found in most drainages of the Winds in the highest and most remote areas. Our goal is to take people to beautiful places, where trout abound, and where the simple camp life can cleanse our minds and bodies. Rejuvenation is why our trips are a true vacation. Fishing in the Wind River Range begins right after ice-out (usually late June) and continues through September. In a normal season, the water level in the streams between the lakes is high until late July. The best stream fishing is from late July into September. Lake fishing is most productive when done "New Zealand" style--spotting and stalking individual trout. Anglers who haven’t done this type fishing find it very enjoyable. 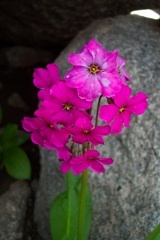 July is the time of snowmelt, the season for the most flowers and the most mosquitoes. Blooming flowers and hatching mosquitoes directly follow the snow banks. As the season progresses and the soil dries, flowers go to seed and mosquitoes look for melt water puddles at higher elevations. August is the month with the least solitude, but is always consistent for good fishing, reasonable weather, and fewer bugs. September is autumn in the high country. One rarely sees another individual after Labor Day; mosquitoes have vanished, the nights are cold, the aspen are in full glory, and snow is on one’s mind. All high mountain trips are run with an eye to conservation and safety. 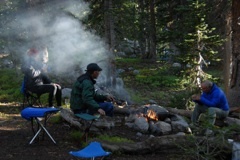 Guests will find our camp areas clean and primitive, with almost no sign of "use." Camps are placed in areas where one will see few other people and few other people will see our camps. We go to extreme effort to maintain water purity. Where wood is plentiful, fires may be used. We encourage catch and release fishing, although in many areas we will keep a few small trout for supper. No fish will be packed out. George Hunker started Sweetwater in 1977 along with his wife Paula. George has personally led most of the trips into the Wind Rivers. He is a former National Outdoor Leadership School Instructor and staff member, former rancher and farmer, the father of three children (many of which are smarter than he is), a lover of the outdoors, an addicted fly fisherman and fly tier from his youth in New Mexico, and a humble husband. George was named the Orvis Endorsed Fly Fishing Guide of the Year for 2003! See George's most recent profile. 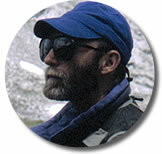 Jim Ferguson has worked with Sweetwater for many years, while maintaining his two-decades-long association with NOLS. Jim is so qualified it defies categorization. 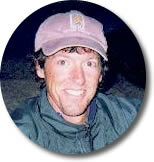 He was named NOLS Instructor of the Year in 1998 and "Master of Outdoor Education" in 2001- one of only six field instructors to ever receive this honor. A graduate of Amherst College, Jim is known for his thoroughness, thoughtfulness, and love of teaching. He is a consummate mountaineer, with world-wide experience. He grew up fly-fishing with his Mom and Dad in New York State. His experience in the Winds and Chilean Patagonia has hooked him on the guiding life. Hank Hunker has been helping his dad, George, for a bunch of seasons now. He has a graduate degree in fly fishing, sleeping in a down bag, and mountain good humor. Hank grew up fly fishing in the Winds, and has probably "picked up" more about the sport than most people have forgotten. He is a great caster and an excellent and patient teacher. He is working on his video techniqes (some of the fruits of which you can find on this website). Hank is our chief drift boat guide and expert. As his Dad slows down, he will be doing many of the mountain trips by himself.